Car suspension is the term used to describe a structure of springs, shock absorbers and linkages that connects a car to its wheels. A suspension system contributes not only to the car’s road-holding or handling but also its braking, safety and comfortable driving experience, insulated from bumps and vibrations. Though it may appear incredible, the designs of first suspensions for automobiles were motivated by the horse-drawn carriages, which were the most popular mode of transport prior to the introduction of first batch of automobiles. These were, primarily, ‘beam axles’, in which a sturdy beam was connected through leaf springs to the vehicle’s chassis and the wheels were fixed at the ends of the beams. Even though solid beam axles functioned quite efficiently and are actually still used in commercial and heavy-duty vehicles, need to provide better travel comforts forced car designers to consider suspension designs that provided superior ‘ride and handling’ characteristics. This is the period when designers used ‘swing axles’ and ‘trailing arm suspensions’ in an effort to provide cars better features in terms of withstanding bumps and enhanced steering and handling comforts. While the Corvair is a fine example of a car that adopted swing axle suspension, the design of VW Beetle was based on a trailing arm suspension. One of the major suspension designs developed was the MacPherson strut. This design was first adopted by Ford in the 1950s soon after it was developed. It is extremely popular with car makers for its simplicity and compactness and automobile companies producing cars on a large scale employ this design extensively. Cars based on the MacPherson strut are cheaper because of the simplicity in design and its compact design facilitates a drive axle to move across the steering knuckle that the strut is connected to. In view of these features, it became, in effect, a norm for all front wheel drive cars in the 70s and is adopted quite extensively even now. Although it is a popular choice because of its simple design, compactness and low manufacturing costs, the MacPherson strut was not considered suitable for superior- performance cars in terms of quality of ride and handling. Automobile engineers specialized in suspension designs, in search of better control and handling, came up with the ‘double A-arm’ or dual ‘wishbone’ suspension that enables a vehicle to achieve peak ‘cornering force’. Even these days, the solid axle is used in the rear for very powerful cars. As in the case of front suspension, leaf springs were used for rear suspensions as well. Several cars produced on a large scale used this rear design until the early 80s. However, leaf springs are no longer popular and instead, coil springs or struts are now being used extensively. Positioning of the solid rear axle is achieved by trailing links and lateral control rods that control the movement of axle during acceleration and while applying brakes. There are other designs for linking and controlling the movement of live axle. However, the 4-link is generally the most common and popular design being employed for cars still using a solid rear axle. However, very few manufacturers, these days, use a solid axle for the rear suspension of the car. Separate rear suspensions are generally used these days, irrespective of whether a car is a front wheel drive, rear wheel drive or all-wheel drive. The design of rear end suspension of front wheel drive cars is, normally, a modified version of front suspension. These designs are, normally either a MacPherson design suspension or an A-arm system. On the contrary, rear wheel drive cars generally employ separate designs for front and rear suspensions. The use of ‘multi-link’ rear suspensions to permit a smooth drive without comprising on quality of handling is quite common these days. With all-wheel drive cars, the usual type of suspension design adopted is the MacPherson strut or uneven length ‘double A-arm’. All-wheel drive cars are normally known for superior performance and their suspension tuning features ‘handling over ride quality’. Now that you know the science and history of car suspension, you will know what to look for when you are choosing a donor car for your DIY electric car conversion project. 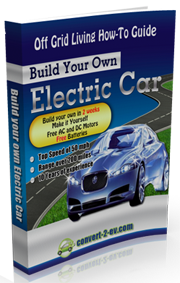 For more tips and tricks on EV conversion on a budget, checkout the Convert2EV ebook by Les and Jane Oke. The Okes have been living a green lifestyle for more than 15 years. One way of keeping their carbon footprint small is to use a homemade electric vehicle. The Convert2EV manual was written based on their experience converting old gas guzzlers to pure electric cars. Click on the link below to visit their web site right now.